Batman continues to follow the trail of those that helped turn Bruce Wayne into Gotham City’s Dark Knight. His latest stop is Hugo Strange, though his connection is a bit tenuous. Yes, he had a role in one of Batman’s earliest adventures, but it pretty much ends there. He then moves on to Jason Blood, a.k.a. the Demon, Etrigan. Apparently when young Bruce was preparing for his war on criminals, he somehow anticipated the occasional trip to hell or encounter with the occult. Really?! Is Batman that precognitive? Or maybe it’s just a throwback to the wacky 1960s when Batman had a suit for every possible need. Frozen north? Check. Outer space? Check? Under sea? Check? Gates of Hell? Check. Tomasi then takes Batman to the man who created all his wonderful toys. No, not Lucias Fox at Wayne Industries R&D. In an amazing ret-con, apparently Wayne’s go-to gadget guy was Silas Stone, father of Cyborg. (No, he wasn’t.) And this is where secrets are revealed, in a wee bit of foreshadowing from the aforementioned Hugo Strange, and my review for the previous issue. I have no idea how this particular turn of events came about, or even if I am correctly interpreting the final page. 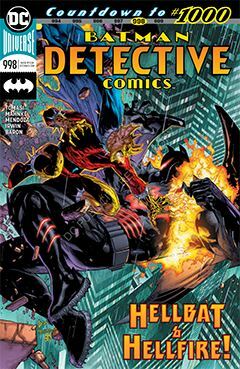 But in a comic book where a guy can create a battle suit for fighting supernatural creatures, and manages to actually throw one back into the demonic underworld, you have to forgive a lot. Just go with it.